BANGI, 12 August 2014 – Globalization and environmental changes as well as economic and financial uncertainties are causing growing inequalities, extreme poverty, exclusion and the denial of basic human rights in the world. There is thus an urgent need for innovative solutions conducive to universal values of peace, human dignity, gender equality, non-violence and non-discrimination, Secretary-General of Ministry of Science, Technology and Innovation (MOSTI), Dato’ Sri Dr Noorul Ainur Mohamad said. She was speaking at a round table discussion organised by the United Nations Educational, Scientific and Cultural Organization (UNESCO) and Institute of Malaysian and International Studies (IKMAS) of University Kebangsaan Malaysia (UKM) here today. The two day round table which discussed “Inclusive Policy Approaches and Data Gaps, Challenges and Opportunities: Selected Case Studies in ASEAN”, was organised in collaboration with UNESCO, University of Melbourne and Trinity College Dublin. Dr Noorul is Vice President for the Asia-Pacific Region of the Intergovernmental Council (IGC) of UNESCO’s Management of Social Transformation (MOST) Programme. Objectives of the roundtable were aligned with the philosophy and work undertaken by UNESCO’s MOST Programme, which focuses on building efficient bridges between research, policy and practice as well as promoting a culture of evidence-based policy-making. She said such discussions are important as they promote innovative solutions that take into account the needs and aspirations of the people, regardless of gender, age and status while focusing on the most disadvantaged groups. Malaysia had in 2003 developed its National Social Policy which is committed to promoting and providing a fair environment which respects different cultures, languages, beliefs and traditions. The goal is to create a progressive Malaysian society with everyone having the opportunity to develop his or her potential to the optimum in a healthy social environment based on qualities of unity, resilience, democracy, tolerance and equality. Dr Noorul said the formation of ASEAN, which is centred on the people, could be considered as a concrete move towards realising the aspiration of the people to achieve good governance, transparency, higher standards of living, sustainable development, women empowerment and greater opportunities for everyone. 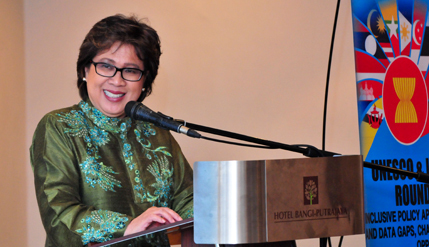 She was confident that Malaysia would contribute significantly towards the future direction of ASEAN and especially when it comes to the protection of human rights of all the citizens and the promotion of their social inclusion in all spheres within the society. ASEAN is thus in need of an environment which is inclusive and can bring on board the knowledge, experience, contributions and needs of all groups. Dr Noorul said information and opinions can be gathered through discussions at such meetings and then forwarded to decision-makers in order to develop inclusive public policies which will take into consideration the voices, contributions and roles of everyone and not just the advantaged and privileged groups. She said social transformation through inclusion and innovation must be at the crossroad of the common activities of the people. Academicians, both national and international and representatives from various government departments and agencies attended the meeting. Deputy Vice Chancellor (Research and Innovation) Prof Dato’ Dr Mazlin Mokhtar attended the event representing Vice Chancellor, Prof Datuk Dr Noor Azlan Ghazali. Director of IKMAS Prof Dr Rashila Ramli and Director of UNESCO Jakarta Office Prof Hubert Gijzen was also in attendance.